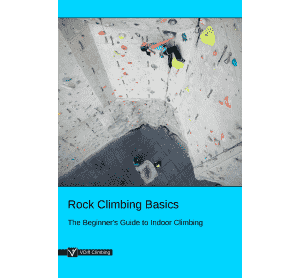 'How To Wear a Climbing Harness' is part of the e-book - Rock Climbing Basics: The Beginner's Guide. 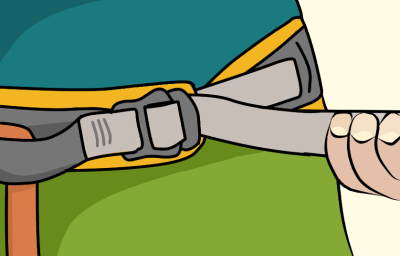 Open up all the buckles on your climbing harness so both the leg loops and waist belt are at their biggest size - but don't undo them completely. 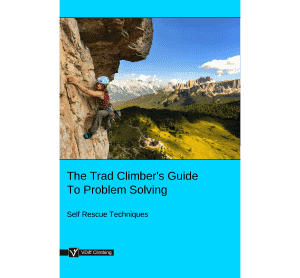 Lay the harness on the floor, with the leg loops underneath, so it's easy to step in to. 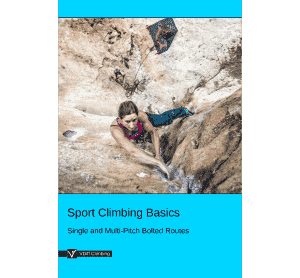 Make sure the belay loop is at the front. Step one foot in to each leg loop and pull it up so it sits well above your hips. 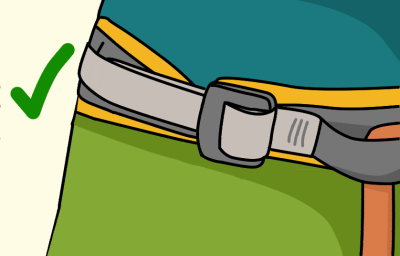 The waist belt needs to be on the narrowest part of your waist, not sitting low on your hips. Next, you'll need to fasten the waist belt. Start by feeding the webbing through the square. 'Double back' the end by feeding it back through the buckle. And then pull it tight. You should be able to slide a couple of fingers between it and your waist, but no more. 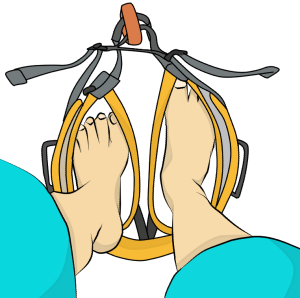 This may feel uncomfortable at first, but it's essential in case you fall upside-down – then you won't fall out of your harness! 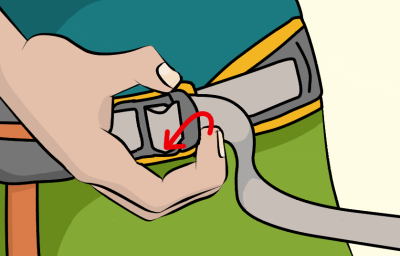 Tuck the loose end of the strap away (there's usually elastic or a tab for you to do this). 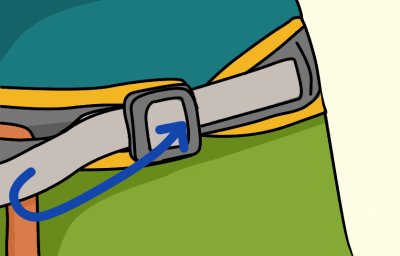 If there's a second buckle on your waist belt, repeat this step with it. 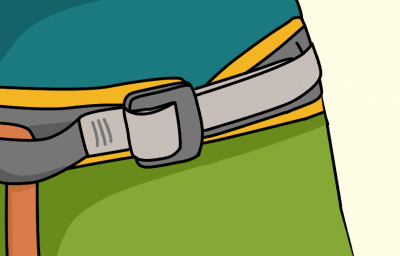 The buckles on your leg loops will also need fastening, if there are any. 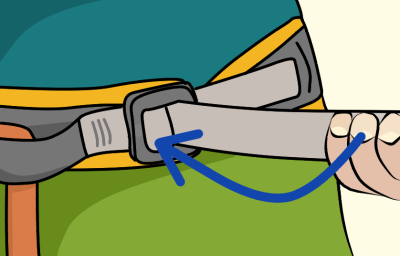 Fasten the leg loops in the same way, if they have buckles (some harnesses have fixed size leg loops). 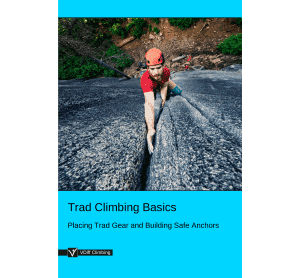 Check that your climbing harness is fastened. If you've done it correctly, the buckle makes a 'C' for closed. 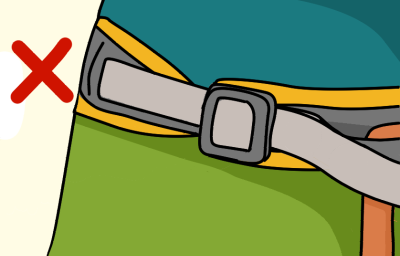 If you've forgotten to 'double back', the buckle makes an 'O' for open. This is not safe. 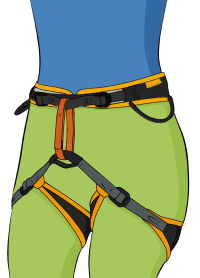 Some harnesses have 'quick-adjust' buckles which are always 'closed'. They simply need pulling tight. 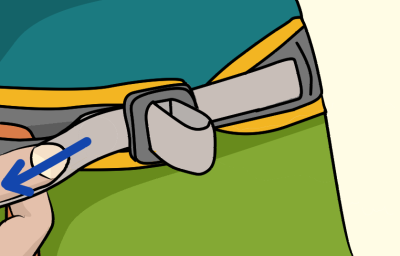 When it's tight, tuck the loose end of the strap away. To release, just pull up on the buckle's edge. 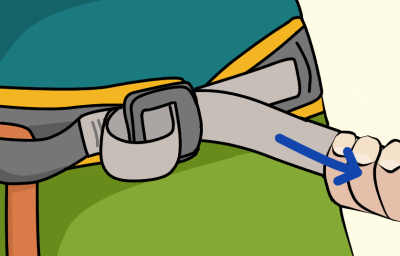 Make sure you know which type of buckle you have and be certain you understand the manufacturers instructions on how to fasten your particular harness.